Righto, time for us to head off into the night too. Hang on! Before you drift off into the land of nod, here's some final Augusta-themed bedtime reading/viewing/listening. Listen: Who's the mystery Masters sneezer? Make sure you join us again tomorrow, (As if you dare not.) Head to the Red Button (09:15-10:15) for day one highlights, while plenty of clips of the best shots will also appear on the website. Then we'll be back about 13:30 BST with live text, images, chitter, chatter and all-round good fun. See you then! Ernie Els does a good job of trying to explain how on earth he carded a nine - a quintuple bogey - on the opening hole. "I couldn't take the putter back. I had three goes and then it went all over the place. I don't know how I stayed out there. The last thing you want is to be out on the golf course. "I'm not sure where I'm going from here. If you have snakes in your brain it's difficult. Maybe I need a brain transplant. "It's hard to explain. Something withholds you from doing your normal thing. I could go on the practice putting green and make 20 straight three-footers." Blistering driving, streaky putting. That's Rory McIlroy's opening day in a nutshell. But that's much better than the likes of Green Jacket rivals Bubba Watson, Rickie Fowler and Jason Day. All three had back-nine meltdowns...and let's not even mention Ernie Els again. He'll be having nightmares of that first hole in his comfy king-size bed tonight. "It certainly was a disappointing finish for McIlroy. He played some loose shots but the eagle and birdie on the two par fives in the back nine catapulted him right up there. "He was right where he wanted and hoped to be. He had done more than what he hoped and expected, to fall away it will certainly hurt." 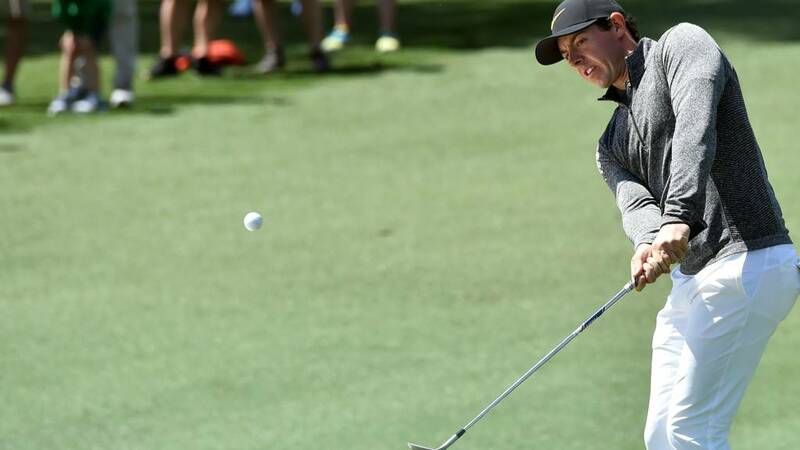 "McIlroy is certainly in the mix but Jordan Spieth, relentlessly, has taken this first day and set alight the 80th Masters." Follow these links for tee-off times and a full leaderboard. Rory McIlroy has just slipped off the front page of the leaderboard, but he is still in the mixer. Jordan Spieth leads the way, just ahead of a whole pack of stellar names. Nope. That ropey old second shot left McIlroy with a tough ask...and he's not managed to save it. His par putt never looks introducing ball with hole. It's just short, an easy finish for bogey. Two blobs in the final three holes leave Rory four shots off the pace. Before he tackles that one, playing partner Bill Haas comes on from the fringe. He's just short, tapping in for par and a three-over 75. "That is a nasty lie. At best McIlroy can get that 15-20 feet to the hole. "That is a terrible feeling when you walk up to the ball and it is absolutely buried." Plop. McIlroy goes right...and he's eating sand. Soft, white sand. Rory McIlroy studiously looks at his course guide. He's got about 160 yards left to the flag after pulling his drive on 18 slightly to the left. "That is an excellent opening round for Lowry." "Shane Lowry is a very good player and he can certainly win here at Augusta." Teeth clenched, jigging on the spot. Shane Lowry looks terrifying as he wills his ball to drop for a birdie on the last. Not this time. The Irishman finishes with a four-under 68. Good. Very good. But after going out in 31 it could have been so much better for the bearded one. Pressure? What pressure. Rory McIlroy doesn't do mental meltdowns. He sees his par putt on the 17th sink without a trace. "That was just a mis-hit from Danny Willett. It didn’t look like a good stroke." Contrasting fortunes on the 18th green for Danny Willett and Sergio Garcia. Willett's putter is usually his most reliable tool, but he slides wide his par putt on the last to finish two under. The Yorkshireman looks tempted to lob his putter. Don't do it! Garcia caps a splendid back nine with another par. The Spaniard scrawls a 69 at the bottom of his card, turning around a two-shot deficit with a 32 on the way back.